The bus had 29 passengers, including the driver. In a tweet, U.S. President Donald Trump said he called Trudeau to offer his condolences to the families of victims. Darren Opp, president of the Nipawin Hawks, said a semi T-boned the players’ bus — an account police confirmed. “Everybody is just so devastated. 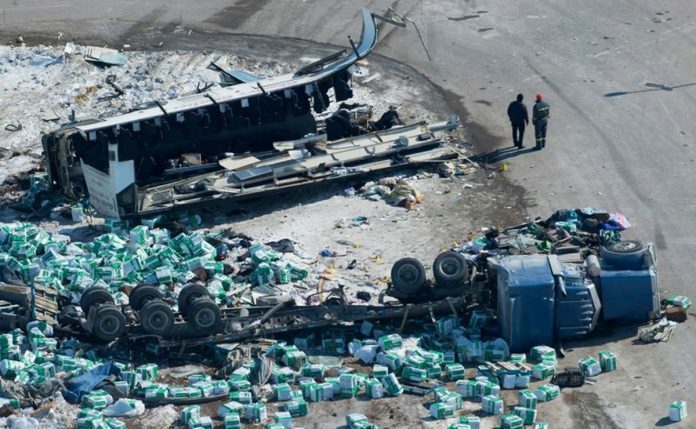 These poor young boys,” said Penny Lee, the communications manager for the town of Humboldt. The Chicago Blackhawks and Winnipeg Jets wore the name “BRONCOS” instead of their nameplates on Saturday night.